A USB dongle used for controlling 1 universe (512 channels) of DMX. 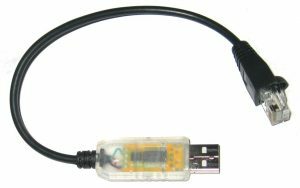 The dongle uses the FTDI chipset and is Open DMX compatible. Non isolated and with ESTA RJ45 pinout. Dongle ships with a RJ45 joiner as linked too below. This dongle can be run as an Open DMX device under Light-O-Rama, LightShowPro, Vixen or Xlights lighting softwares.